Members of the new First Presidency bring their past experience to bear on the Church’s future direction. The day after he was ordained and set apart as 16th President of The Church of Jesus Christ of Latter-day Saints, President Thomas Spencer Monson addressed the media on Monday, February 4, 2008, honoring his predecessor and expressing his desires that his administration be one of unity, cooperation, and reaching out. With his newly called counselors, President Henry B. Eyring and President Dieter F. Uchtdorf, sitting at his right and left, President Monson paid homage to President Gordon B. Hinckley, who died Sunday, January 27, 2008, after serving as President of the Church for nearly 13 years. The two men served together in the First Presidency and Quorum of the Twelve Apostles for more than 40 years and met together on an almost daily basis while in the First Presidency, making decisions and discussing goals. Among the hallmarks of President Hinckley’s administration that President Monson said he hopes to continue are temple building, traveling, and the Perpetual Education Fund. Though President Monson announced no abrupt changes to policies or programs, he made it clear what he hoped the tenor of his administration would be﻿—working together in the spirit of cooperation and reaching out in the spirit of love. President Monson said he believes each member has a responsibility to be active in his or her community and to work cooperatively with people of all faiths and organizations to bless lives. “It is important that we eliminate the weakness of one standing alone and substitute for it the strength of people working together,” he said. President Monson was ordained an Apostle on October 10, 1963, and has served as an Apostle for more than 44 years, including his time as Second Counselor to President Ezra Taft Benson and Howard W. Hunter and as First Counselor to President Hinckley. However, in spite of his long experience in Church leadership, he said he plans to rely heavily upon the members of the Quorum of the Twelve Apostles, the Quorums of the Seventy, and the Presiding Bishopric in moving forward. Known for his tender stories of caring for individuals, President Monson hopes that members will also reach out to those in need both temporally and spiritually. “As a Church we reach out not only to our own people but also to those people of goodwill throughout the world in the spirit of brotherhood which comes from the Lord Jesus Christ,” he said. “We desire to cultivate a spirit of kindness, of understanding, of love. We seek always to follow our Savior, ‘who went about doing good’ ” (Acts 10:38). President Monson attributed his desire to lift those in need to the example of his mother. Born on August 21, 1927, to G. Spencer and Gladys Condie Monson, President Monson spent his younger years living near railroad tracks on the west side of Salt Lake City. Young men coming west to seek employment during the Great Depression would frequently stop at their home, having heard that food or help was available there. “I saw my mother minister to those men, totally unafraid, no fear in her at all,” he said. “In fact, she gave them each a lecture that he should write his mother and tell her where he was and that everything was going to be all right. President Monson’s desire to serve others has blessed the lives of many both in and out of the Church. He has served as a member of the National Executive Board of the Boy Scouts of America since 1969. In 1981, U.S. President Ronald Reagan appointed him to serve one year on the President’s Task Force for Private Sector Initiatives. As bishop of the ward with the largest welfare load in the Church at age 22, he spent one week of personal vacation time each Christmas to visit each of the 84 widows in his ward. These visits continued decades after President Monson was given other Church assignments for as long as the widows lived. Between 1950 and 2000, President Monson spoke at the funerals of all 84. As he looks at the road ahead, President Monson said he recognizes challenges but remains optimistic. “Our young people live in a world of many challenges, and they should be prepared to meet them and not be overcome by them,” he said. He laid the responsibility upon parents to teach their children how to pray. President Monson expressed optimism based on the strength of Church members. “How grateful we are for the dedication, the faith, and the strength of the people of the Church, who now number more than 13 million in 176 nations and territories throughout the world. Of that work, President Monson testified that it is the Lord’s. “I have felt His sustaining influence,” he said. Following the death of President Hinckley, President Monson said he went to his knees, “thanking my Heavenly Father for life, for experience, for my family, and then directly asking Him to go before my face, to be on my right hand, to be on my left hand, and His Spirit in my heart, and His angels round about me to bear me up” (see D&C 84:88). The Church of Jesus Christ of Latter-day Saints is led by 15 men in two bodies: the First Presidency, consisting of the President of the Church and his two counselors, and the Quorum of the Twelve Apostles, who are called by and serve under the direction of the First Presidency. The members of the Church sustain each of these men as prophets, seers, and revelators. When a prophet dies, a new prophet and President of the Church is chosen in an orderly manner by a process put in place through revelation and used throughout the history of the Church. Upon the death of the President, the First Presidency is dissolved, and the counselors revert to their places of seniority in the Quorum of the Twelve Apostles, determined by the date they were ordained to the Quorum. The Quorum of the Twelve Apostles becomes the leading body of the Church with the senior Apostle, or President of the Quorum of the Twelve Apostles, at its head. The Quorum of the Twelve Apostles meets to decide whether the First Presidency should be reorganized or whether the Quorum should preside over the Church. If a motion to reorganize the First Presidency is passed, the members of the Quorum unanimously select the new President of the Church. The senior Apostle has always become the new President. The President then chooses two counselors to form the new First Presidency. Following the reorganization of the First Presidency, the Apostle who has served the second longest is sustained as the President of the Quorum of the Twelve Apostles. If he has been called as a counselor in the First Presidency, the Apostle next to him in seniority serves as the Acting President of the Quorum. The new President of the Quorum of the Twelve and the other Apostles set apart the new President of the Church. 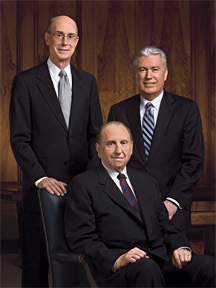 President Thomas S. Monson, center, became the 16th President of the Church on February 3, 2008. His counselors in the new First Presidency are President Henry B. Eyring, left, and President Dieter F. Uchtdorf. The new First Presidency and the Quorum of the Twelve Apostles meet with members of the media. President Thomas S. Monson addresses the media after being introduced as President of the Church.